A few weeks ago I decided to try making gnocchi. I’d been thinking about doing it for a while, ever since I read about a traditional potato gnocchi recipe, but I was worried it would be a huge failure. Gnocchi are easy to mess up — too much flour makes them heavy, not enough flour makes them fall apart. Some recipes call for egg, more traditional recipes don’t… and then there’s the need to smash everything up but not puree it, so that meant doing some mashing by hand, not using the food processor. I guess I was feeling courageous one evening when I had a half a butternut squash left and needed some inspiration to use it. 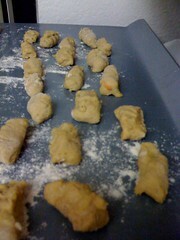 I started to look for a gnocchi recipe and found one online that seemed simple enough. I added more flour than the recipe called for since the dough wasn’t coming together enough, and when I rolled out the first bit and started cutting the little pillow shapes and trying to curve and mark them with a fork, they looked like a bit of a disaster — misshapen, lumpy and a bit sticky. Thankfully, things got better from there, and the rest of the batches looked a bit more appetizing, though maybe I should have just skipped the fork step — it creates a more traditional look, but isn’t required. I cooked them in small batches in boiling water for just a couple of minutes each, and topped them with some butter and asiago cheese. I served them with some tasty green beans with almonds, thyme and dijon mustard — a really delicious recipe (even with much less butter than called for), and a few tomatoes. The gnocchi were a little bit denser than I’d hoped, but for a first try I think they turned out quite well, and they had an interesting slightly sweet and nutty flavor from the squash and cinnamon. Hey, why have I not been reading your awesome blog. Somewhere I must have gotten lost! 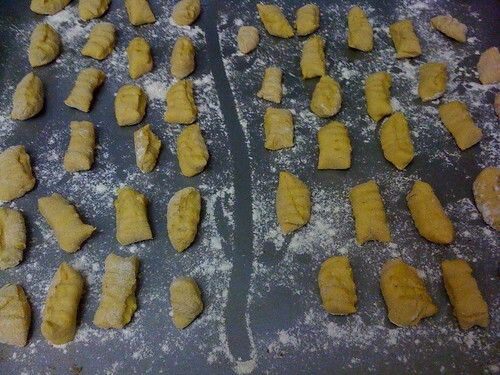 Your gnocchi making is way more impressive than out tortellinis. OMG these look aaa-maaa-zing! 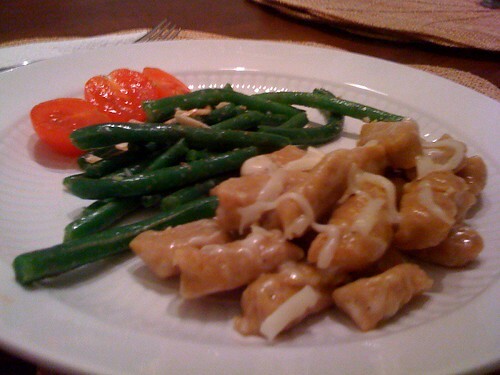 I love gnocchi, and can’t believe you made them from scratch – I’m inspired!